There is no doubt the Pista Concept frameset is one of the most requested items from dealers nationally. The PC has developed a large amount of street cred to the point that making enough to sell has been at times tough. But, when you're given lemons, time to make lemonade right? Fortunately our UK family has the solution for us Yanks. 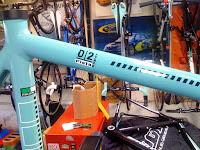 The D2 Super Pista frame. So the million dollar question is, why this and not the Pista Concept? Well, for starters this frame is stiffer than the PC. Secondly, it is stronger than the PC. The PC is solely a track bike, or at least that is the intended purpose of it. 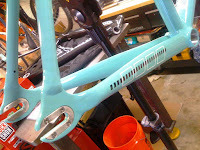 This new frame track ready but the D2 SP frame will hold up to the rigors of non-track riding, if you get my drift. Urban use, non track use, commuting use, enough said. Yes. That is a big frame. It's celeste paint despite looking more like light blue. 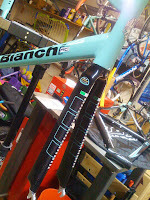 That's the magic of the pearl based Bianchi paint. Depending on the lighting, it will look historically celeste(green), or in bright lighting, the pearl blue will dominate the color spectrum. Love it! The 61cm frame has 38mm high chainstays with the typical stainless inserts at the dropouts. Here we have the fork lifted from the 2008 D2 Crono. Speed is of the essence here. The front brake mount comes covered with a small classy Bianchi Eagle that can be removed for the installation of a front brake. Ahhhh, front brake, couldn't do that on the PC, eh? Here is the build up for now. 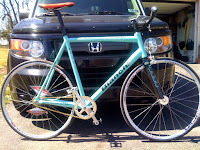 Naturally I aspire to build up a wheelset with something more appropriate for a bike of this sweetness. 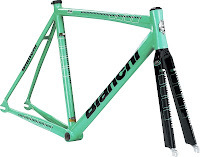 fork BIANCHI FKU CARBON/ALU 1-1/8"